The year 2017 marks the 10th anniversary of LCMS ministry work being done in the Dominican Republic. As a result of what the Lord has been doing through His Gospel work over these 10 years, five missions have been established. Two Lutheran schools have been started, along with Good Shepherd Lutheran Homes which seeks to serve people with intellectual and physical disabilities throughout the country. A seminary is being built which seeks to serve men and women throughout Latin America. Pray for Ted and this missionary team and the formation of pastors and deaconesses. 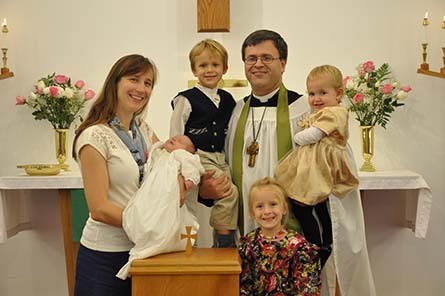 Ted is a 2001 graduate of Concordia Theological Seminary, Fort Wayne. Rebecca has a master’sdegree in biochemistry and formerly worked in a genetics research lab, studying cardiovasculardisease and diabetes. She previously served for two years as a long-term missionary in Slovakia.Previously, Ted served in Venezuela for eight years. Rebecca joined him after they were marriedin June 2008. Ted and Rebecca enjoy spending time with their five beautiful children - Esther, Matthias, Natalia Anna, Evangeline and Azariah. The Kreys write, “Give thanks with us in this Reformation year that it is still all about Jesus and the telling of Him and the forgiveness of sins to people who do not yet know. Pray for us that even more churches would be planted so that all might be gathered where Jesus is and receive His gifts. Please ask the Lord of the harvest to call more men and women in service to Him." Learn more about the work God is doing in the Dominican Republic and in the Latin America and the Caribbean region.